SSuite WordGraph Editor is a free and very useful alternative to Microsoft's Word, OpenOffice's Writer, or anything else out there claiming to be the latest and greatest. You don't even have a need for .NET or even JAVA to be installed. Use WordGraph for anything from writing a quick letter to producing an entire book with embedded illustrations, tables of contents, indexes, and bibliographies. 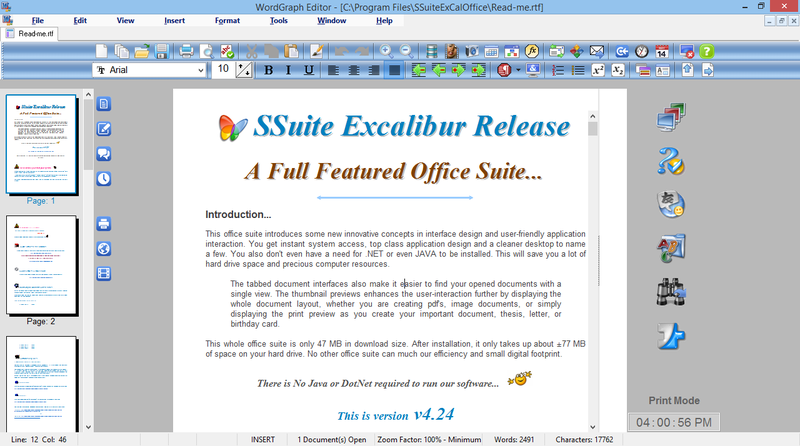 SSuite WordGraph Editor Free Download - we do not host any SSuite WordGraph Editor torrent files or links of SSuite WordGraph Editor on rapidshare.com, depositfiles.com, megaupload.com etc. All SSuite WordGraph Editor download links are direct SSuite WordGraph Editor download from publisher site or their selected mirrors. Has the best features other word processors don't have!! 8.48.10 Jan 12, 2019 Major Update Made various updates and enhancements to all software applications. 8.48.8.1 Jul 7, 2018 Major Update Made various updates and enhancements to all software applications. 8.48.6 Jan 27, 2018 Major Update Made various updates and enhancements to all software applications.